To take a walk in this park, you may need some swim fins and a diving mask. 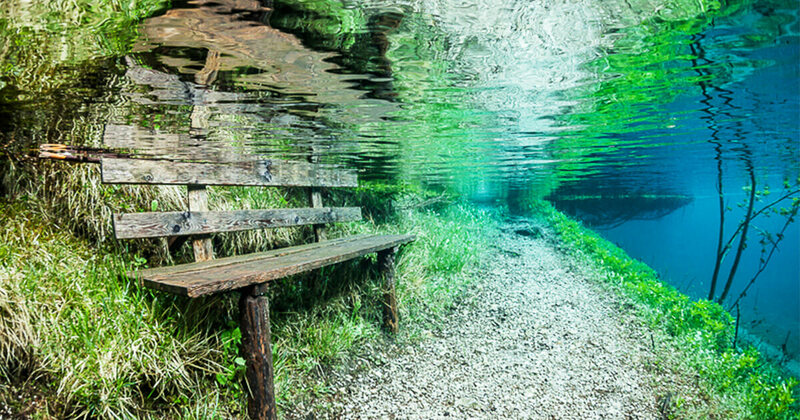 Every year, a park in the foothills of Austrian Hochschwab mountains, turns into a massive pool with all of its footpaths and benches submerged under water. Fear not, says photographer Marc Henauer, it’s not a cataclysm. Rather an unusual natural phenomenon caused by the melting snow which increases the lake level in spring. Also, the perfect background for a surreal underwater photo shoot. Every spring this park shifts from trekkers and gives its way to underwater explorers by turning into a literal swimming pool. Situated by the emerald waters of the Grüner See (Green Lake), this park is a tourist attraction throughout the year. But once the snow-capped Hochschwab mountains begin to melt, all the lovely park tracks, bridges and trees submerge into an underwater world. The average lake level is only 1-2 meters for an area of 2000 sq. meters. But in May it rises rapidly and reaches the depth of 10-12 also covering an area of 4000 sq. meters. According to the photographer Marc Henauer, the feeling of being in an underwater park is magical and the visibility is incredible, something only tropical seas have. “Underwater, we feel a magical world. The sun creates fantastic light rays through water. Then you think it is a dream and you expect to see goblins appear,” says Henauer. The incredible phenomenon lasts for only 3 to 4 weeks in the spring, however. Henauer says they’ve spent a week on site to realize this photo series. Henauer’s incredible pictures of the Green Lake in Austria have won the 3rd place award in the 2014 National Geographic Travel competition. To see more of his photographic works, check out Marc Henauer’s Facebook page or visit his website.